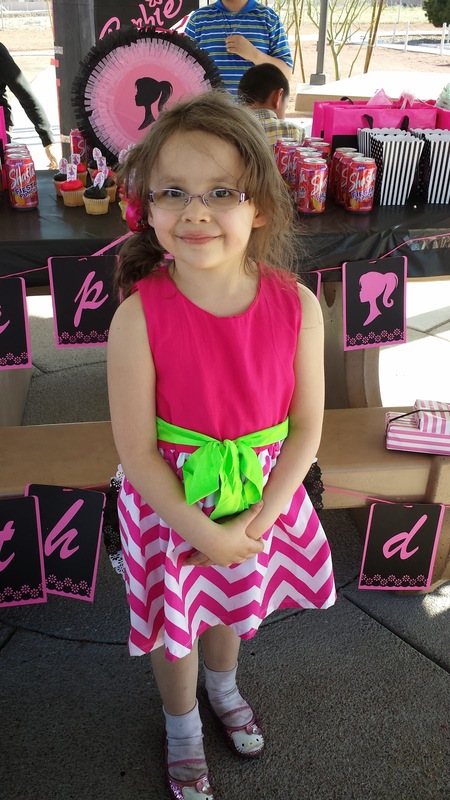 So my kids keep growing and no matter how much I tell them to stop it just keeps happening.So my beautiful daughter just turned 7, still can't believe it. 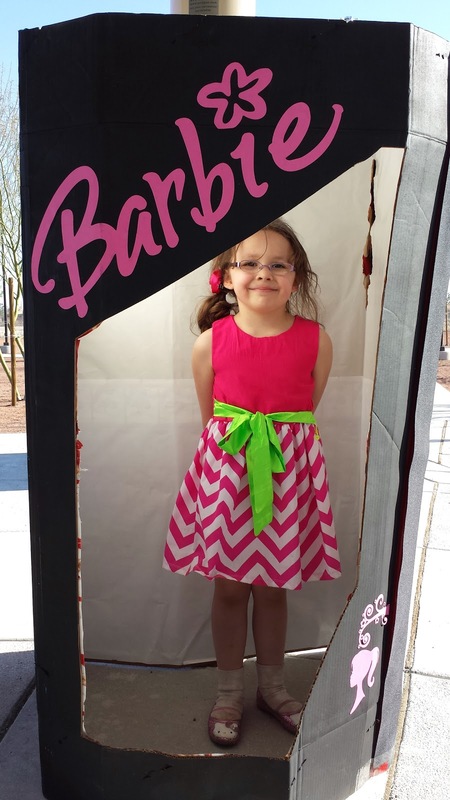 Well we had her birthday party at the park and decided it would be Barbie themed. Mostly because last year my store (work at Michaels) had a great sale on a ton of Barbie stuff so I called up my daughter and said well how about Barbie for your next Birthday.And if you have followed my blog for a bit...and thank you so much for those of you that do...you know I plan my parties at least 6 months in advance.Does not mean I actually get started on them that far but I do plan them...lol. So anywho...here is what I came up with. Well pretty much all the decorations were made by hand with the help of the Silhouette Cameo and Supplies from Michaels. Love using the Cameo to create all the cuts I needed. 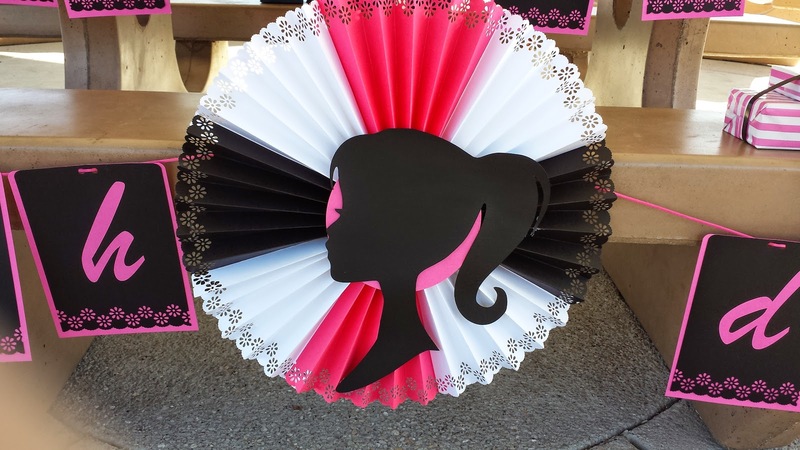 And created a Barbie Silhouette that using throughout the party. 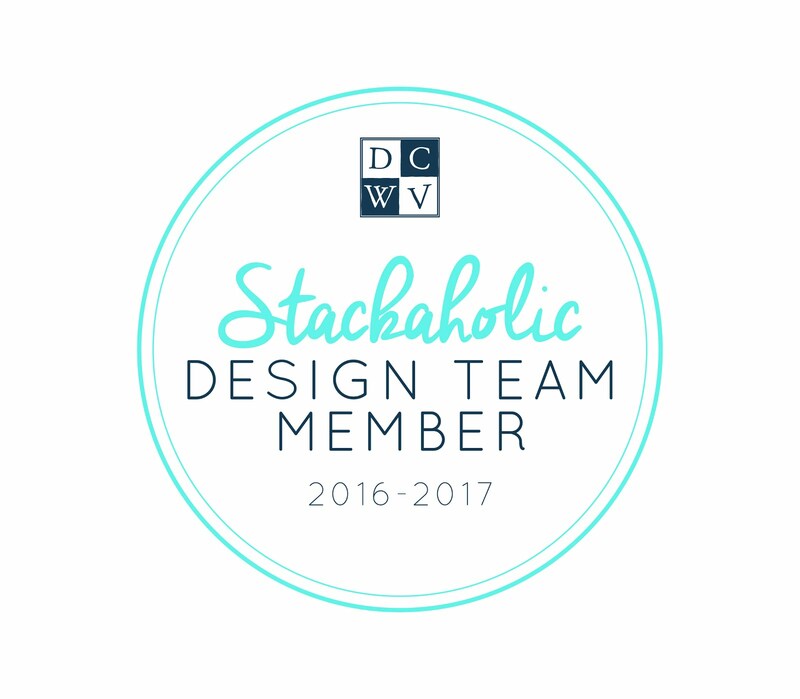 The banner was made easily by just layering two colors of card-stock and used the boarder punch on the bottom of the black layer only. And corner rounded the top edges of both pieces of card-stock. The letters were cut on the Cameo. 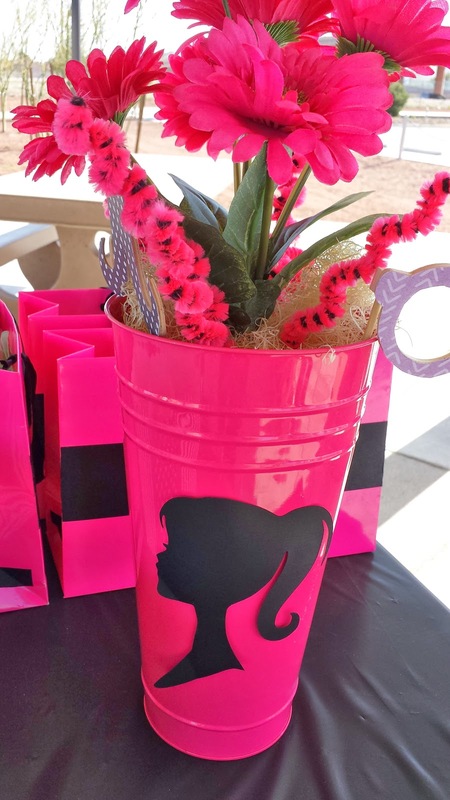 The bags behind this long cute vase of flowers also have a little Barbie Silhouette on the fronts. The bags were a fantastic buy from Goodwill years ago. I used them during my daughters Hello Party. 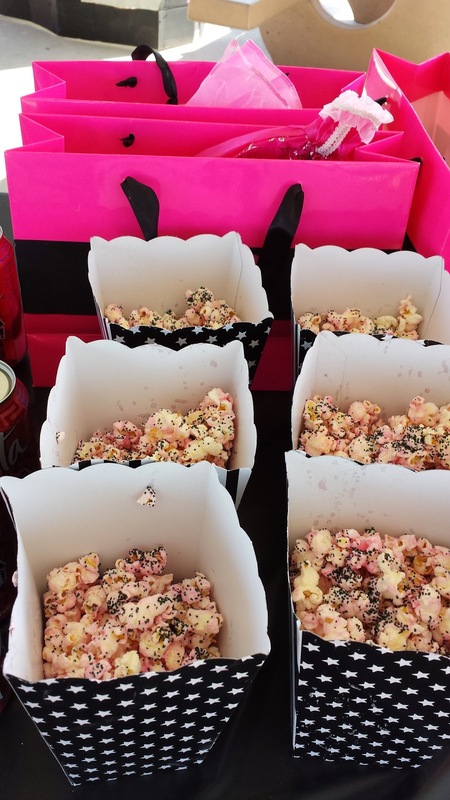 Always a hit at parties. Ordered from a chain supermarket. Next time i make my own. OK so here I cheated a little and used store bought cupcake toppers. 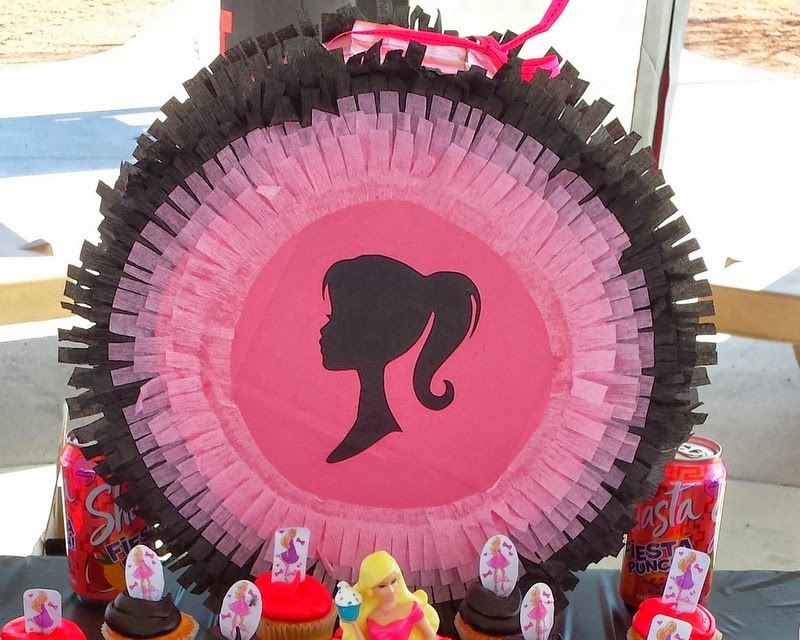 A Barbie Pinata I made myself. I got the directions on a video off YouTube. But I change how i did a few bits. Check out the video and my changes here. Who I should have taken a picture of before she started playing. Even came with a cute hair clip. It got a little banged up thanks to the wind that day. Again I used the Cameo to cut the letters and silhouette you can just barely see on the bottom right. I saw the idea on Pinterest of course. OH MY GOSH. It took about 6 hours to make. Mostly because I spray painted it and the cardboard just kept sucking up paint. And because I used whatever left over cans were in the garage which happened to be cheap cans. I would definitely recommend using Krylon. Or brush painting it. 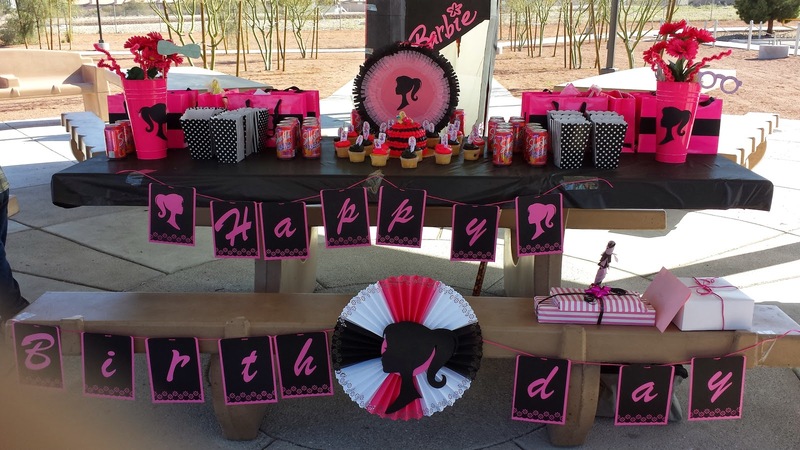 This birthday bash is fabulous and was super inspirational as well. The colors that have been used are my favorite, and why not, I am a girl and pink is almost every girl’s favorite. 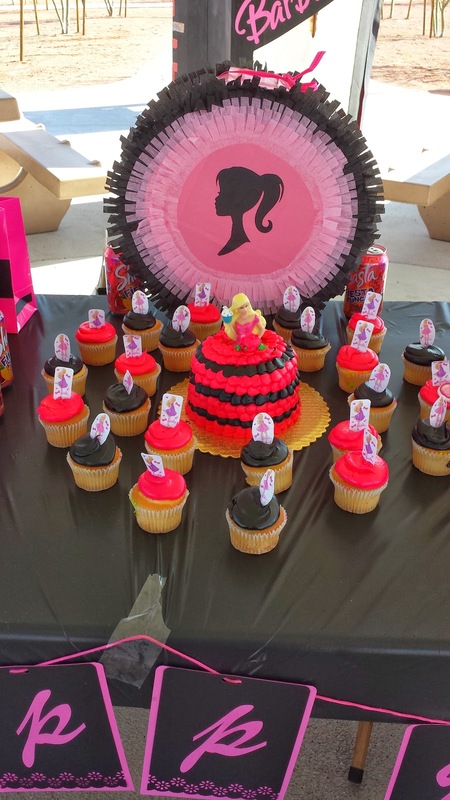 For my 15th birthday bash, I too would be using black and pink theme. The party would be hosted at one of the best venues in Los Angeles.